Chicagoans are abandoning their city’s buses at alarming rates. Why? The answer is made clear in Chicago’s first-ever Bus Friendly Streets Report Cards. Data in the newly-released report cards shows bus speed and reliability on the decline because buses routinely get stuck in traffic and at red lights. Active Trans developed the report cards using publicly available bus tracker data from the Chicago Transit Authority (CTA). See report cards for all 50 Chicago wards and eight of the city’s high-ridership routes at www.activetrans.org/busreportcards. The letter grades are based on bus speed, bus bunching and wait time. How many of each letter grade was handed out to the 50 wards? How many of each letter grade was handed out to the eight highest ridership routes? Buses account for more than half of Chicago’s public transit trips, but ridership has dropped 21 percent since 2012. Without more investment in bus service, Chicago risks more people abandoning transit for transportation options that are more expensive and less efficient, healthy and green. Declining ridership can create a downward spiral of reduced revenues, service cuts and fare increases. 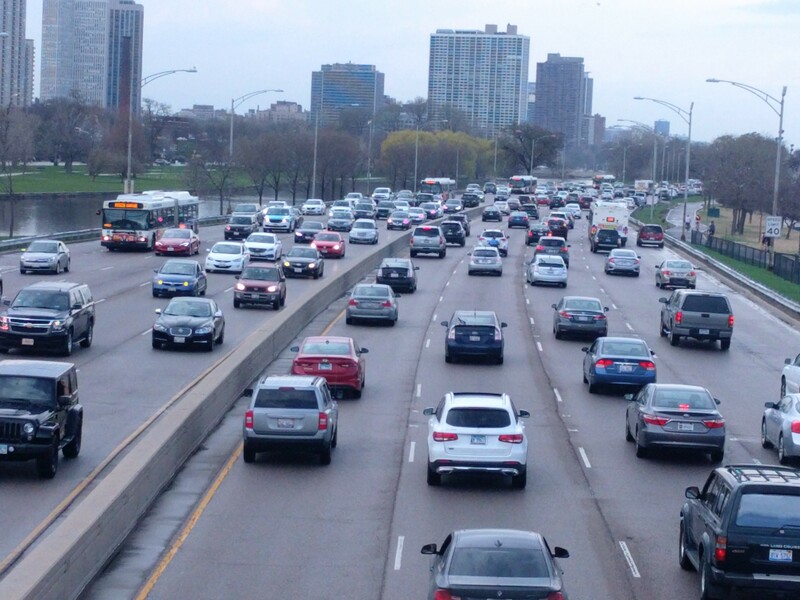 To reverse this ominous trend and ensure all Chicagoans can get to jobs and other destinations, city leaders must give buses priority on city streets. Buses move many more people than cars while taking up a fraction of the street space, and yet Chicago and other cities continue to give priority to people who drive alone. Active Trans developed these report cards to help bus riders organize for service upgrades in their neighborhood and ask aldermen to make local bus service a priority. These improvements have been implemented with initial success recently in Seattle, San Francisco and New York City. Sign up as a Back on the Bus volunteer to learn how you can use these report cards to fight for improvements in your neighborhood. Lower quality bus service has major equity impacts. A disproportionate number of bus riders live in low-income communities or work in places that lack access to the Chicago L or Chicago Metra stops. Substandard bus service hurts these Chicagoans the most while discouraging higher-income residents otherwise inclined to ride. Speed and reliability of bus service are not the only factors that influence ridership. Factors such as how frequently buses arrive, the land use of the surrounding neighborhood, and the safety and comfort of bus stops also play a role. Active Trans has been working with community groups around Chicago to identify other aspects of bus service that need investment and improvement. Groups we have been working with include the Northwest Side Housing Center, Pilsen Alliance, Six Corners Association, Southwest Organizing Project and Westside Health Authority. Report card data was analyzed from 6 a.m. to 6 p.m. on weekdays in May 2018. Visit the report card website for a full breakdown of the methodology.